If you know this song, then you surely love this song. Who doesn’t? It would be so easy to take it and its wonderful lyric for granted, as we might so many of Ray Davies’ songs – ‘Waterloo sunset’, ‘Dead End Street’, ‘Big sky’, to name just three – songs which sound like they have existed forever and will go on existing forever. But listen again closely, as if for the first time. Hear a melody which has in it all the melancholic joy of the lyric. Hear those words, as particular as a prayer you’ve said from childhood. Recite them back. Believe them of yourself as if you were Ray Davies and had just written them (whatever or whoever he wrote them about). Remember that one day back in the sixties he had to bring this song into being, that it hasn’t existed forever. Hear in its unfolding how it will go on existing forever, an echo that will outlast the species of creature which created it. Think of Kirsty MacColl’s wonderful version of it; think of her no longer being with us, and be grateful for still experiencing days. Think of the scene in Until the end of the world, Wim Wenders’ follow-up to Wings of desire, in which it is played and sung along to while Jeanne Moreau’s character lies dying. Think of how you found this single four years ago in a wooden crate in an antiques shop, its record company sleeve dishevelled, the vinyl dirty and more than a little scratched. Think of the lift it gave you to find it, of how you didn’t care one jot about its condition or the glaring mistake of the unnecessary apostrophe in the song’s title on the label. Think of how you only ever played it a few times because of all the scratches. Think of how you play your CD copy to your daughter, who of course doesn’t yet get it, who won’t get it for a good long while, you hope, because she is in among her days and has yet to lose something, anything, anyone. Think of so many things, of how songs like ‘Days’ and ‘This strange effect’ interweave with lives and can bring us to tears and make us smile and sometimes both at the same time for reasons at once hard to fathom and entirely comprehensible to any outside observer. God bless the Kinks. God bless Ray Davies. God bless everyone who loves this song. Which might be thought a somewhat passé thing to declare but for the fact that Pete was saying it in November 1967, directly after the Summer of Love. Miller’s exploration of Ray Davies’ idealised village green is mind-expanding in the non-chemically induced sense, showing just how out of step with the times the Kinks became in the space of a few short months. Evidently it didn’t help that the Kinks’ record label, Pye, were also at odds with the times. Together with last minute changes of heart by the perfectionist Davies, the mockers were put on the record at the moment of its release, and only the passing of time has corrected the silence that greeted it. Still I wish that ‘Mr. Songbird’ had made the Preservation Society’s final cut, and not the throwaway floweriness of that minor concession to the times, ‘Phenomenal cat’. 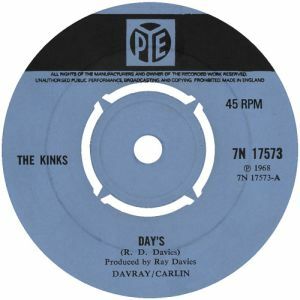 But the songs were up against the shifting preferences and inner conflicts of Ray Davies, and so, rather than a perfect LP, we are left with an almost perfect one.